Brand: Vermont Teddy BearType: Classic/Jointed TeddySize: 16in. Top Rated SellerBrand: Vermont Teddy BearType: Classic/Jointed TeddySize: 36in. Know they're overzealous about anything zombie related?. Surprise them with the Zombie Love Bear! He's frightfully endearing with gray fur, red eyes, a facial scar, razor-heart tattoo, tattered jeans and screen-printed tee. HE BOUGHT AS A JOKE GIFT FOR GIRLFRIEND AND IT WAS PUT RIGHT IN A CONTAINER FOR SAFE KEEPING. NO FLAWS OR STAINS. FULLY JOINTED. THIS IS A CUTE VERMONT BEAR WITH A PLAID DRESS WITH A PENCIL BUTTON. SHE ALSO IS WEARING GRANNY STYLE GLASSES. Small stain on the shorts. Westcliff Collection Rare Vintage Teddy Bear EUC 15"
Great 16" jointed Vermont Teddy Bear. on the bottom of his feet are wear spots where he was standing material pressed. Her arms and legs are totally jointed, and her heads turns. Notice the cute little Silk Roses ove her left ear. She is a Limited Edition, Rare and Hard to Find Bear. Vermont Bears are friends for life. 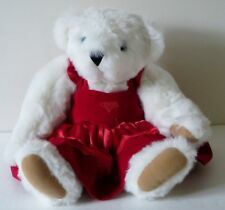 Vermont Teddy Bear - White - 16" - 2011 - Jointed. Condition is Used. Shipped with USPS Priority Mail. Great condition. To rips, holes or stains. You are looking at from the Vermont Teddy Bear the Ballerina Bear from the Pocket collection from 1995. She is in Excellent condition. Vermont Teddy Bear, brand new in box! It has jointed Movable legs and arms. We Value your opinion greatly, and will make every effort to earn your loyalty. 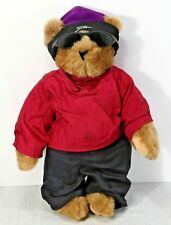 Top Rated SellerFrom United StatesBrand: Vermont Teddy BearType: Classic/Jointed TeddySize: 16in. Brand: Vermont Teddy BearType: Classic/Jointed TeddySize: 15in. Classic jointed construction. There is sticker residue and possible tearing/bending. The bear itself is excellent. The Vermont Teddy Bear TAG Complete Companion Valentine's heart boxer shorts 17"
Excellent condition, adult owned and displayed. Vermont Teddy Bear Black White Cow Jointed Stuffed Plush 15". It has jointed Movable legs and arms. He is Wearing Bib Denim Jeans and Wearing a copper bell. We Value your opinion greatly, and will make every effort to earn your loyalty. Top Rated SellerFrom United StatesBrand: Vermont Teddy BearType: Classic/Jointed TeddySize: 15in. VTBC Vermont Teddy Bear Giraffe BearAnimal Collection Jointed Plush Stuffed 16"
Jointed Plush Bear Giraffe with ossicones and tail. Deep purple plush fur with a purple velvet bow tie detail. 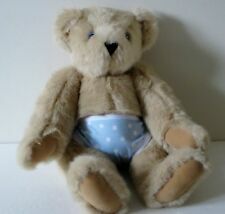 Pre-owned Vermont Teddy Bear Angel White Bear Plush with Blue Eyes - Fully Jointed. Made of soft white fur, has blue eyes, and she wears an ivory color dress with angel wings. It is in great and clean condition. THIS IS A 15" VERMONT TEDDY BEAR AUTHENTIC GET WELL SOON PLUSH. HIS EYES ARE IN SCRIPTED WITH BORN IN VERMONT. HIS BLUE AND YELLOW GET WELL SOON BOWTIE IS REMOVABLE. 17" 1999 White Katerina Ballerina Vermont Teddy Bear for Zany Brainy -Pink & silver Dress & Shoes. Good Pre Owned condition. Lovely Bear! Sweet Soft Green Spotted Dragon/Dinosaur. Vermont Teddy Bear Co. This listing is for a Vermont Teddy Bear. She is in excellent shape no holes or stains. Shipping is free. We are a smoke free home. Thank you for looking at my listing. Jointed arms, legs and head turns around. 21", this is top of head to bottom of feet. (total length). A little over 13" sitting. Angel bear has jointed arms and legs, feather wings, white robe with gold trim, and gold halo. Item is sold as is. Here is a HIGH QUALITY VERMONT TEDDY BEAR LARGE 16" FULLY JOINTED PLUSH TEDDY BEAR WITH REMOVEABLE STUFFED "I LOVE YOU" VALENTINE HEART AND TUXEDO COLLAR WITH BLACK SATIN BOW TIE. HE'S VERY LOVEABLE! Condition :Good Pre-owned Jumper Dress has small Stain. Hand Made Vermont USA. Vermont Teddy Bear: Classic/Jointed, Golden Brown. G et well Soon Doctor bear with the outfit and pillow. S elling my wife’s collection of Genuine Vermont Teddy Bear Made in USA. Pre-owned Hard to Find and RARE Vermont Teddy Bear Rainbow Tattoo Beige Bear Plush. Pre-owned Vermont Teddy Bear Love at First Bite Vampire Black Bear Plush - Fully Jointed. 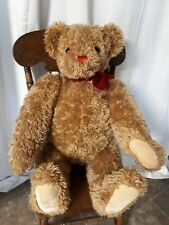 Gorgeous Vermont Teddy Bear....clean and in like new condition....fully jointed...soft snow white fur with striking blue eyes, brown sueded pads on paws and feet and a big red velvet bow....includes original booklet...soft and cuddly...16 inches long..made in USA...free shipping! This is full sized, 16". Must be one of the older ones, the current crop is from China. Looks to be dressed as a Handyman or Construction Worker. No evidence of smoking or pets. Check it out in the photos. Like all Vermont Bears, she is a friend for life! She was born in Shelburne, Vermont, USA! She was made with all new Materials, and filled with Dreams and Love. She is Glorious, dressed in her White Satin Wedding Gown! Beautiful condition and has been only displayed. 16" in Height. Baker, Mother, Grandmother, Cook. Displays Great! Vermont Teddy Bear Co. ~ Angel Bear ~. Bear in in nice pre-loved condition. 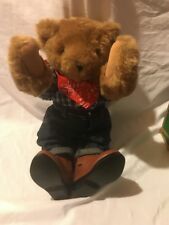 Adorable Light Brown Jointed Vermont Teddy Bear Co. Adorable red bandanna collar! Excellent Condition! The Vermont Teddy Bear company was founded in 1981 in Vermont by John Sortino, who made them on his wife's sewing machine. Shortly afterward, he started selling the stuffed animals at an open market and added mail order to the company with Bear Grams. Vermont Teddy Bears are handcrafted in the company's Shelburne, Vermont headquarters. What types of teddy bears does Vermont Teddy Bear manufacture? The Vermont Teddy Bears come in various categories that correspond with holidays such as birthdays, holidays, professions, birth announcements, and other similar themes. Each of these categories has unique eye colours, fur colours, names, and attire. Additional boxed goodies can also be added. The availability of each attribute can vary depending on the type of bear chosen. Where are the teddy bears made? Each Vermont Teddy Bear is handmade at the company site in Shelburne, Vermont, where a "Bear Crew" cuts, sews, stuffs, stitches, dresses, boxes, and ships them. Most have jointed movement, paw pads, and suede noses. All of these parts, including the eyes, are made in the United States. Their outfits are also designed at the Vermont Teddy Bear company site in Vermont and then sent to a factory to be manufactured. Where is the material used to make the bears from? The material that they are stuffed with is from the United States. Some of the fur is purchased from the United States but others are purchased from other countries. This is due to the fact that specific materials the company utilizes are only available elsewhere. One example of this is mohair, a silky type of goat hair, sourced from Germany. What sizes and colours are available for the teddy bears? The sizes of bear range from a standard 15 inches to a 6-foot oversized Hunka Love bear. There are several colours available. Most of the colours are available for any style of animal. However, the premium fur teddy bears are available in just three colour choices- maple, espresso, and snow. All other teddy bears are available in honey, maple, vanilla, black, buttercream, pink, grey, curly gold, espresso, and snow. The bears also come in a variety of sizes, including 24 inches, 15 inches, 20 inches, 6 feet, 4 feet, and 3 feet. Sell Vermont Teddy Bear Co.